Healthy Living doesn’t mean giving up your favourites foods or standing by the stove for hours and hours prepping and cooking. This delicious meal was made in under 20 minutes. 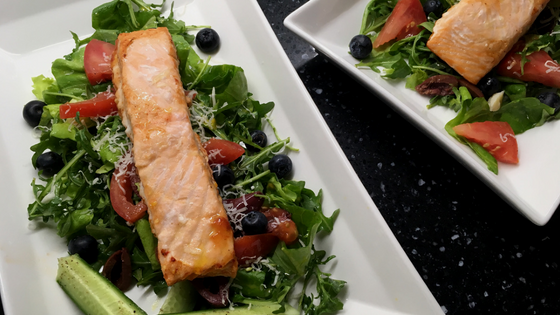 Salmon provides a great source of omega-3 fatty acids which helps to protect against autoimmune diseases, such as arthritis, omega-3 fatty acids are also great for brain health and protect cell walls, which when followed with a healthy lifestyle reduces oxidative stress. If you are a vegetarian, omega-3 fatty acids are also found in flaxseeds, walnuts, and chia seeds. 1. Add all of the ingredients except for the salmon into a large skillet over medium-high heat. Bring to a gentle boil. 2. Place the salmon in the pan, bring back to a gentle boil, reduce heat to medium-low and cover. Cook for 10-15 minutes or until salmon is cooked through. It should only take 10 minutes depending on the size of the salmon. Place on a bed of arugula that has been tossed with extra-virgin olive oil and sea salt (or your favourite dressing). Spinach is another great option if you don’t like arugula. Add some of your favourite salad ingredients and you have yourself a delicious and healthy meal.